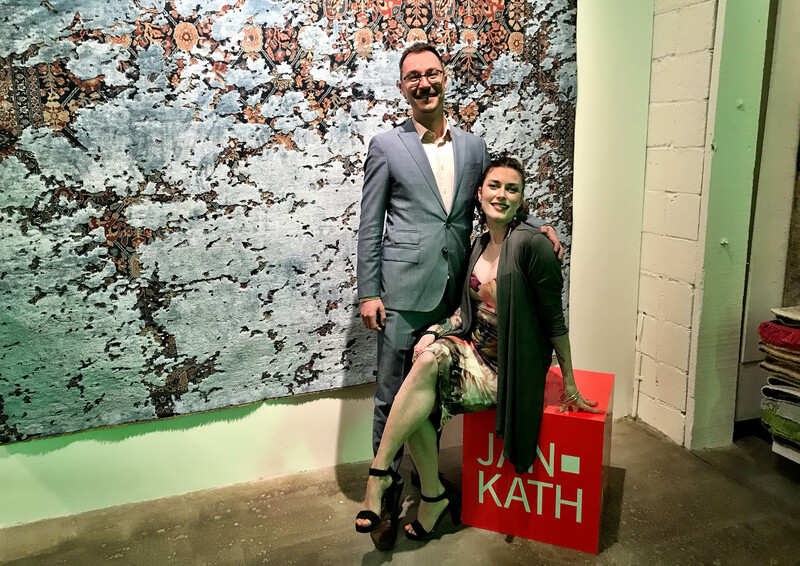 A casual conversation with Jan Kath about rugs and carpets turns intimate before the opening of Jan Kath in Toronto. It was beautiful spring day in Toronto and I had just finished a late lunch with another friend and colleague from the rug industry. Our ‘morning meeting and leisurely lunch’ had turned into an hours long presentation on his part detailing what he sees as faults in the current distribution model of the handmade rug industry; but more on that in a future article. The leisurely lunch I had been promised had turned into something casual and classic – a bacon double cheeseburger and chocolate malt for me – though I had no complaints about this. Burgers are a favourite of mine and a malt is a rare find and treat. Regardless, time was now of the essence as I raced, as much as anyone can in construction plagued Toronto traffic, from lunch back toward downtown for my meeting with Jan Kath who was in town for the grand opening of Finlay and Kath’s newest showroom: Jan Kath Toronto. You can read about the opening party and learn a bit more about its staff in ‘and More!‘ following ‘Over Coffee‘ with Kath. Meeting a German requires a degree of punctuality and though I was not yet late, I was concerned that I would be as the cab driver zig zagged his way through the gridwork of Toronto streets, dodging streetcars and a seemingly inexhaustible supply of orange safety vests, construction cones, pedestrians, and incomprehensibly slow and distracted drivers. My anxiety mounted as he asked me which route I would like him to take as if I was some navigational savant. ‘I just need to get there as fast as possible,’ I replied. My appointment was for 15:30 and when the driver pulled to the curb in front of the Gladstone Hotel where I was staying and entertaining Kath, the clock on my phone read 15:23. Safe! Then Jenni Finlay, partner of Findlay and Kath, messaged: ‘I’m so sorry. I didn’t get Jan out of here on time. He’s in an Uber now but is running late.’ I am sure I rolled my eyes, laughing internally at the situation. I took a few moments to head up to my room in order to preen myself before returning, settling into a very comfortable lobby sofa to await my guest. Jan Kath shown during the opening of Finlay and Kath’s new Jan Kath Toronto showroom on Thursday, 10 May 2018. | Image courtesy of Finlay and Kath. Note Bene: Jan and I both love espresso based drinks. One of us more than the other… . Jan Kath (JK): Michael! So good to see you. I am sorry I am running late. It’s so not like a German to be late. The Ruggist (MC): No problem at all. I took the time to organize a few things from my day already. It’s great to see you here in Toronto, we normally meet in Bochum. Shall we head into the café here and find a table? MC: May I order a coffee for you while you step out? JK: Yes please. You don’t mind? I’ll have a double cappuccino with an extra shot of espresso. JK: So sorry about that. Travel and all. Ah. It’s nice to see you. MC: It’s really nice to see you as well. Thank you for joining me here today, taking time away from the showroom before the opening. Jenni had suggested we do this interview in the showroom but I knew if we did that, we’d not have time to focus. Too many distractions in advance of tonight. I know you are on a schedule so let’s get right to it: I count this as showroom number ten for Jan Kath. The obvious question is of course: What’s the plan, what’s next for Jan Kath? JK: Is it really ten? MC: Well, by counting the ones on your website, yes. JK: You know Michael, I don’t really know if it is ten or not, I don’t keep track. MC: Well from outward appearances you are running quite the empire. It would be difficult to keep track of everything the company is doing. JK: Empire. You think? <MC nods> I don’t think of it as an empire. I’m working far too much for this to be an empire. I imagine an empire would allow me to be more relaxed and just collect money. But I am always go, go, go. MC: That’s a fair assessment [of empire], but we cannot argue against your success. Nor can we expect you to keep track of all the details, empire or otherwise. JK: I actually try to review renderings and images of every carpet we are making, regardless of size or who the customer is. I need to keep my finger on the pulse of the business. It is the details that make a carpet and a successful company. MC: I just received my rug not that long ago; the one I told you about back in January. Did you see that one as well? JK: I am sure I did, but we are making so many carpets. I review them and then… . MC: Lost to the ether? JK: Precisely. And what do you think of your rug? MC: Oh I love it. And of course it’s much nicer to the hand than you might imagine from the photos and renderings. Honestly I had given Kyle [Clarkson, partner of Jan Kath at Kyle and Kath in New York and close friend of Kath’s] the concept but left most of the details to him and your staff. The transition from wool/nettle to silk is imperceptible visually and to the hand, hmmmm, sublime. JK: Always better than the image! Real is always better and that is the difficulty in conveying high-quality carpets. You have to see and to touch. MC: Well the quality and attention to detail… it’s just… while not flawless, it is impeccable. MC: Oh, there is one spot on the iron motif where one of the ‘dots’ was trimmed a little too closely with the scissors. It’s all but unnoticeable. I myself only noticed as I was examining the rug so closely; I feel confident that no other person would even notice. Old habits die hard and finessing a rug as I call it is a holdover from my days selling rugs. I cannot help but look them over closely. JK: But you are happy with it? MC: By all means. It is far better than I had hoped. But as is said ‘Nothing is perfect.’ so perhaps to a future envisaged collector maybe this will add provenance. To get back to my question, that was the plan right? To make high-quality, collectable carpets? JK: There is no masterplan, except to say that we are always looking for new opportunities, new markets for our carpets. China and the Middle East are two emerging markets with potential for phenomenal growth; we should not underestimate China. But to say something about our quality: We are not comparing ourselves to the past, but we know the community of the future will judge our carpets of today. MC: Is that where showroom eleven will be? JK: Actually in August 2018 we will be opening two new showrooms in Riyadh, Saudi Aradia. JK: I cannot say too much you know. But China has cities of say five million people that no one [in the West] has even heard of. Five. Million. People. MC: That’s the potential for a lot of rugs. JK: It is. You know, showrooms are just the anchors. 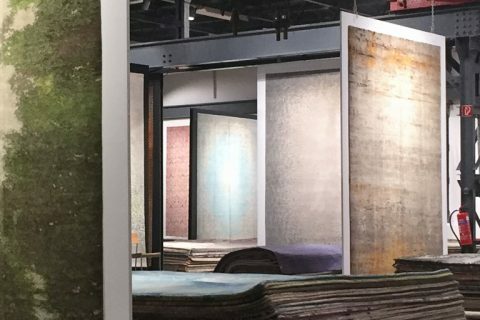 The places where people can come to see a rug in person as opposed to just an image. Designers remain our main focus though, they drive our business. MC: Speaking of ‘go, go, go’ and designers, didn’t you just fly in last night from visiting with a designer? JK: It was actually a private client in Portugal. MC: So if a client is buying enough rugs, Jan Kath himself will come oversee the project? JK: Like I said, I am still working very hard. MC: Indeed. I’ve already had too much coffee today as I flew in very early as to spend the day here in meetings before the opening tonight. Is the showroom looking good? JK: It is. I was actually reviewing the guest list with Jenni this morning. To me it is important to make sure the crowd is the right mix of people – of customers. It’s one of the reasons [amongst several] we stopped exhibiting at Domotex. This opening party is our moment to show the company and our carpets to new clients. It’s important to have the right mix. Do you understand? MC: Definitely! It’s your moment to shine as is said. MC: But you are also enjoying life more are you not? When I saw you in January during ‘A Family Affair’ you were aglow – shinning if you will – with delight as you had finally gotten married. Married life is treating you well then? JK: Very. I am so very blessed. <Kath jestures: > After ten years she finally decided to say yes and make me the happiest man. After ten years together she finally said yes. MC: Well… did you wait ten years to ask? That could be part of the reason. Or had you asked before? JK: I had asked before. And now, finally, she said yes, and I am so very happy. JK: Nairat Kath (nee Thanompiew). MC: Oh! She took your name? JK: She did, but I would have taken her name if she wanted me to. There are some restrictions with that though with the company name, and of course with her immigration status in Europe. [Nairat is Thai by birth.] We actually just found out this week that her visa is all sorted out. But when you find happiness, what does it matter whose name you use? MC: Congratulations. I am all to familiar with the hurdles of immigration. Oh wait, how do I spell Nairat? 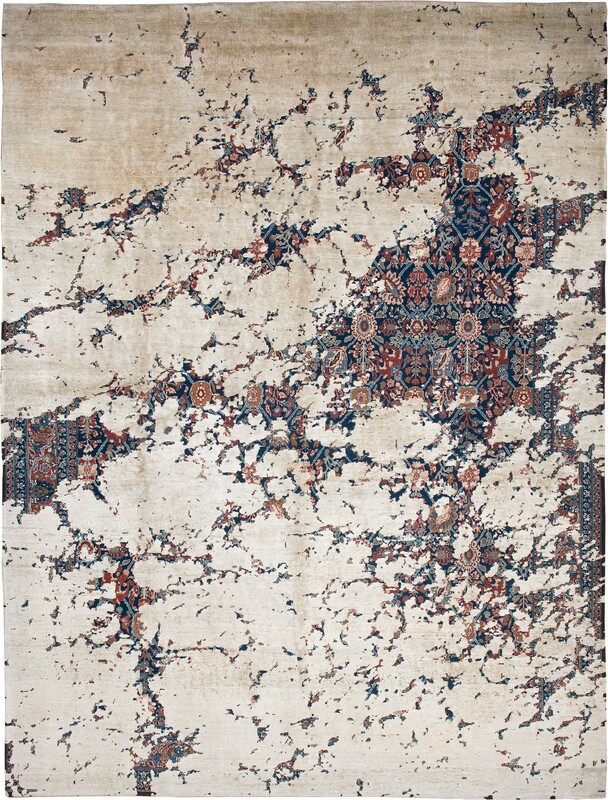 ‘Tabriz Aerial’ from Jan Kath’s ‘Erased Heritage’ collection of carpets. | Image courtesy of Jan Kath. JK: But we are getting off the topic of rugs. MC: We don’t have to talk about rugs. The premise of ‘Over Coffee’ is that we get together and talk, allowing the conversation to go where it may. We can talk about anything, whether I can write about it is another thing. So I just thought, ten showrooms, ten years, today is the tenth of May. There seems to be a pattern developing. JK: You know that is also my birthday. November tenth. Ten. Ten. I was also born on the tenth minute of ten o’clock. When I was little my mother would tell me how special I was because I was born at 10:10 on 10/10. MC: Ahhh. Very nice. How old will you be this year? MC: Lovely, looking good. My birthday is next Friday. JK: And you will be how old? JK: I’m older than you? MC: I am, I cannot help it though. Okay. If ten is such an important number in your life, tell me, what will you be doing in ten years? JK: Not that I am ready to retire yet, and I have no plans to, but looking ten years into the future I would like to maybe step back a bit from the company. Still design, but be able to spend more time with my wife, and to enjoy life. As <Kath makes ‘jazz hand’ motions with his hands in front of him> as it sounds, I would like to spend time gardening. MC: I don’t see anything wrong with that. Gardening can be quite rewarding. Hmm. And since I’ve said rewarding, what would be your most rewarding carpet, your favourite? JK: It would have to be the first Erased Heritage carpet, Tabriz Aerial. At this point I ask a question which causes Jan to hesitate. The pensive look on his face betrays both a willingness to answer the question truthfully but also a desire hold some thoughts more private. He prefaces his answer by saying it is completely off the record, a request I am happy to oblige. After answering that question we never really return to the record per se though we continue to discuss life, privilege, personalities, copyright and copying, propriety, and the like until at some point – becoming aware of the time – I request the cheque from the waiter. JK: Oh thank you. You don’t mind? MC: Not at all. It’s the least I can do. Plus it is the only other rule of ‘Over Coffee’, I pay. Finlay now simultaneously messages us both announcing the pending arrival of the Uber. As such, the informal ‘Over Coffee’ with Jan Kath now abruptly enters permanent hiatus with his departure into the bright spring day outside. The ‘and More!’ of ‘Jan Kath and More!’ continues later in the evening during the opening party of… . After Kath departs I gather my things. It’s shortly after 17:00 and I’ve a few hours before the party at 19:00 though everyone knows it is completely socially unacceptable to show up precisely at the start of an hours long party. I quickly map where the new showroom is located and opt to walk the approximately 4km to the event, planning my departure as to ensure a 17:20-17:30 arrival time. I arrive to find the party just warming up with the small but quickly growing crowd swooning over the entertaining and mesmerizing Jan Kath ‘Flying Carpet’. Peyton Finlay takes the Jan Kath Flying Carpet out for a spin on Thursday, 10 May 2018 in the alleyway adjacent to Finlay and Kath’s new Jan Kath Toronto showroom. 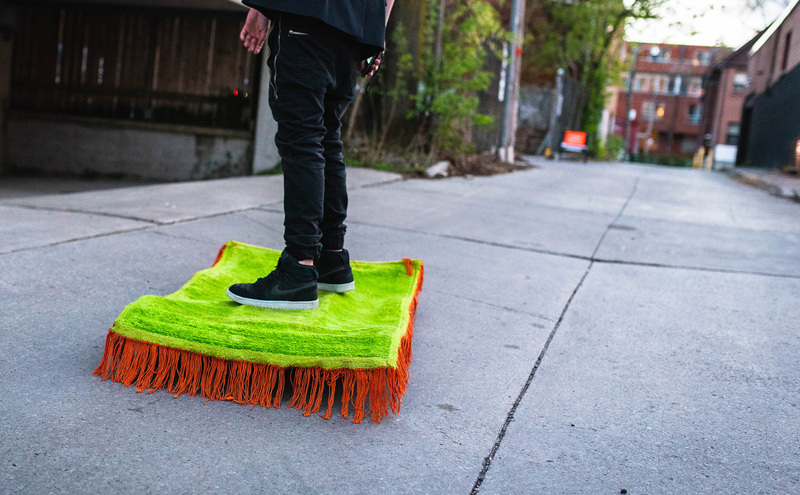 To create the impression of flight, the carpet uses less magic than technology relying on a remote control operated rechargeable battery-powered motorized skateboard fitted with a wavy frame and a scatter-sized Jan Kath rug. | Image courtesy of Finlay and Kath. My agenda for the evening reads like a ‘to-do’ list written by a schizophrenic cat. I need to find a drink. I must say hello to my friend Jenni Finlay who in partnership with Jan Kath owns Finlay and Kath which distributes Jan Kath carpets in Canada with showrooms in Vancouver, and now obviously Toronto. I should make sure to take photos. Isn’t that an intriguing building across the street. I must (again) talk with Kath and follow-up with him on some future agenda items for September. Maybe I should move to a big city? I should find some food. And I absolutely must introduce myself to the dynamic duo that is Yvan Semenowycz and Robyn Waffle. No strangers to the world of rugs they are the intoxicating husband and wife who run the Toronto showroom. 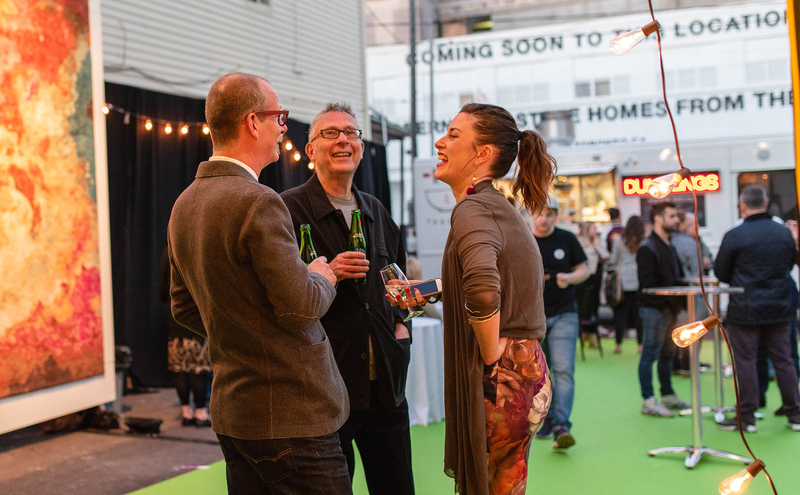 I had spoken with them last summer when Jan Kath first made the jump into the market in temporary space and I’m very much looking forward to meeting them in person. I should pay attention and make note of what other, less endemic guests, think of the carpets. But first, I must find the bar which is easy as it’s situated about midway in the showroom under a glowing green neon sign which reads: ‘Make Rugs Not War.’ I ask for a beer and attempt to return to the outdoors just as the official photographer of the evening, Nancy Kim, is finalizing her pre-party photographs including shooting a photo of the entire staff. My internal dialog encourages me to work as well and so I too snap a photograph. Yvan Semenowycz, Jenni Finlay, Jan Kath, and Robyn Waffle (left ot right) shown primping before the official photographer, Nancy Kim, snapped the group photo just as the opening party for Finlay and Kath’s new Jan Kath Toronto showroom got underway on Thursday, 10 May 2018. | Image by The Ruggist. And this is why you hire a professional! 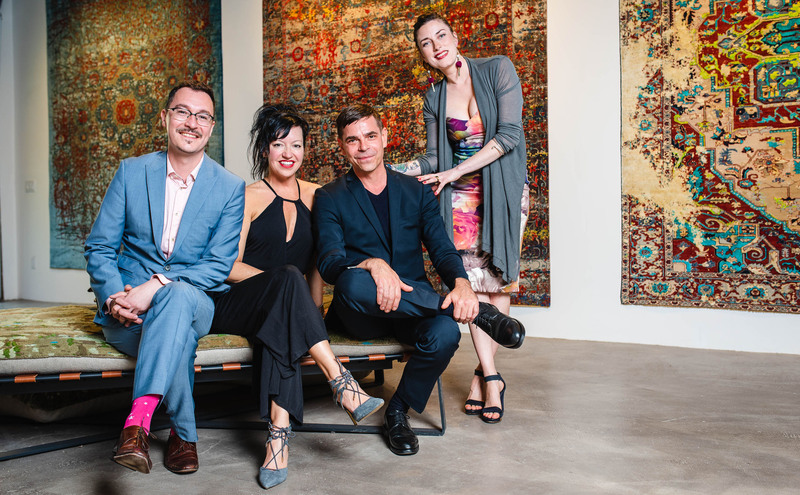 Yvan Semenowycz, Jenni Finlay, Jan Kath, and Robyn Waffle (left ot right) shown properly poised in the official photograph shot by photographer Nancy Kim just as the opening party for Finlay and Kath’s new Jan Kath Toronto showroom got underway on Thursday, 10 May 2018. | Image courtesy of Finlay and Kath. In the summer of 2017 Finlay and Kath opened a small office in Toronto, hiring Yvan Semenowycz and Robyn Waffle to run the location. Semenowycz and Waffle had previously been working in rugs and carpets operating the boutique house of Totem Design Company. 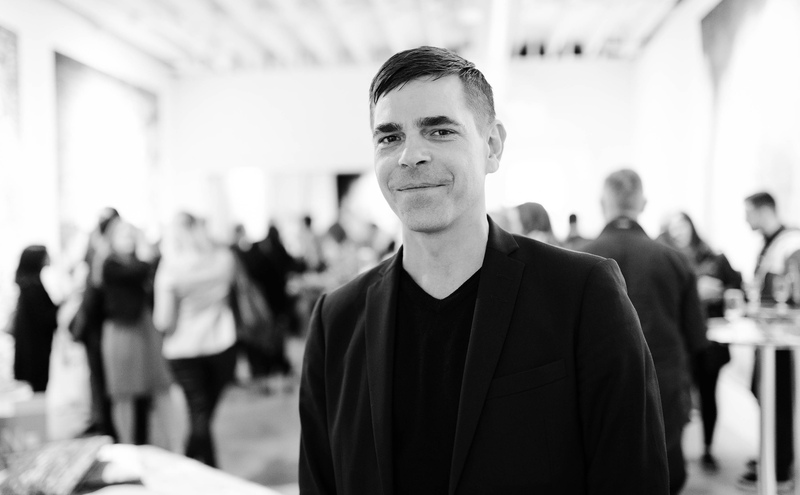 Semenowycz has a degree in Industrial Design and his background includes a touch of oldschool rug world charm in that his mother Luba Huzan, is a former founding parter at Creative Matters Incorporated and still works in rugs via her own studio LHD Tapis. Waffle’s degree is in Fashion Communications and Design and together this due packs the proverbial one, two punch of savvy, stylish, informed design. Regardless, when speaking with the pair during the summer of 2017, their love of carpets was apparent, yet now in meeting them, I’ve come to realize I have competition ‘for the love of carpets!‘. 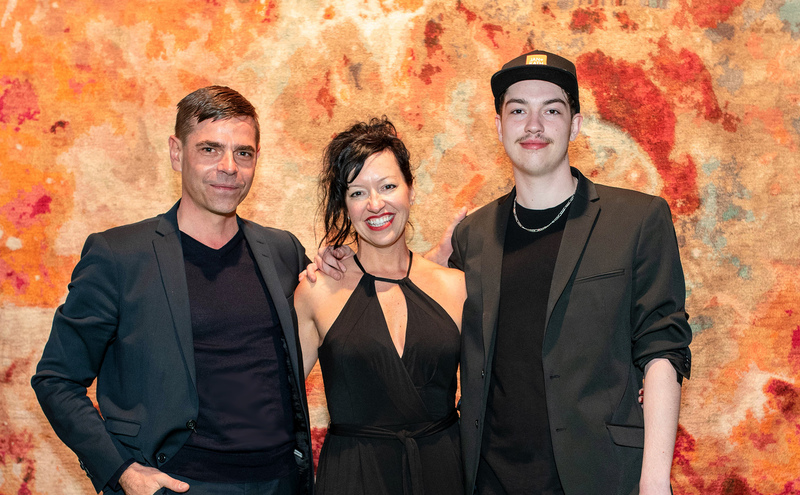 Yvan Semenowycz and Robyn Waffle are a dynamic and intoxicating couple who run Finlay and Kath’s new Jan Kath Toronto showroom. | Image by The Ruggist. ‘Any deep interest or passion cannot be learned, it’s inherent.’ Waffle told me when we first spoke last summer and it is this phrase which sums up not only their passion for rugs, but that of a majority of the staff of Jan Kath globally. 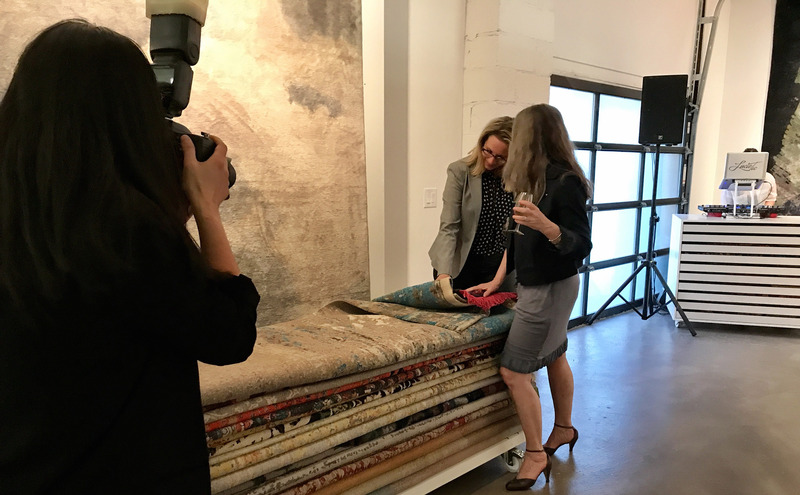 There is a deep rooted interest in rugs and carpets – perhaps beauty itself – which seems to permeate everything the firm does. Jan Kath, Jenni Finlay, and Peyton Finlay (left to right) shown here during the opening of Finlay and Kath’s Toronto showroom, Jan Kath Toronto. | Image courtesy of Finlay and Kath. 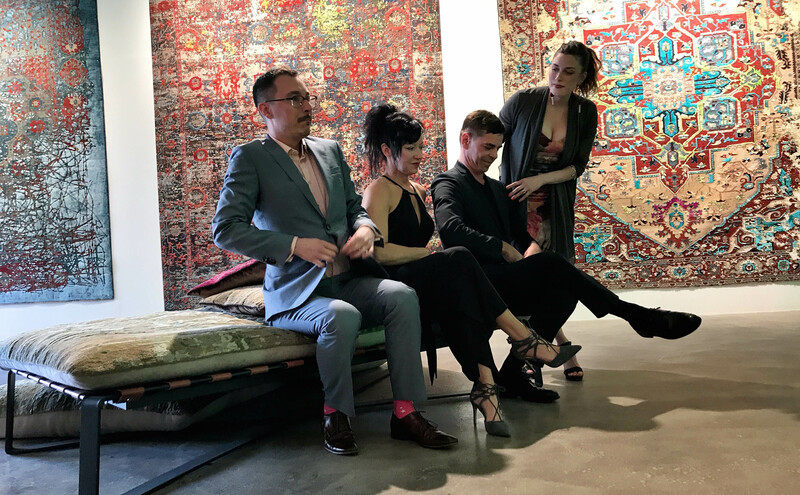 Michael Christie (The Ruggist), Unidentified man, and Robyn Waffle (left to right) shown enjoying libations and humorous banter during the opening of Finlay and Kath’s new Jan Kath Toronto showroom on Thursday, 10 May 2018. | Image courtesy of Finlay and Kath. Note bene: For those not aware. Canada is a geographically huge country spanning a continent. It is approximately five hours from Toronto to Vancouver – by plane. The difficulties of expeditiously serving clients from only one showroom should now be apparent. 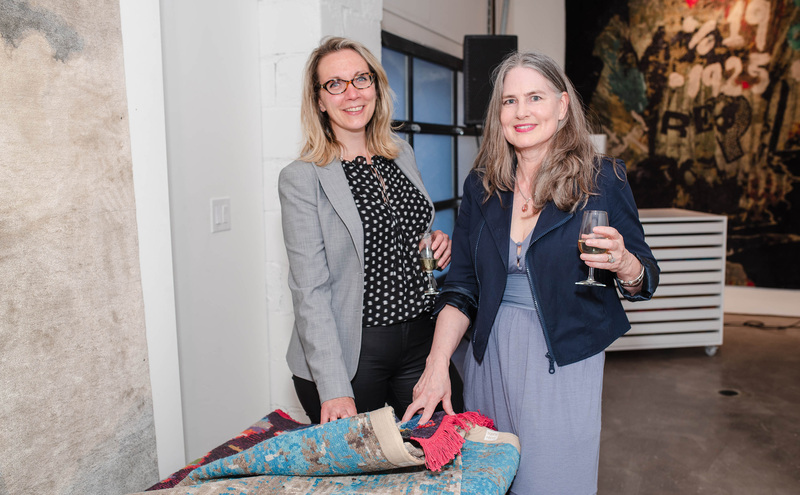 Unidentified women shown browsing carpets and enjoying libations during the opening of Finlay and Kath’s new Jan Kath Toronto showroom on Thursday, 10 May 2018. | Image courtesy of Finlay and Kath. Unidentified women continue browsing at the encouragement of photographer Nancy Kim as she captures their interest during the opening of Finlay and Kath’s new Jan Kath Toronto showroom on Thursday, 10 May 2018. | Image by The Ruggist. I have been following the work of Jan Kath since approximately 2005 when I first became acquainted with the firm by way of a solicitation I received in the mail promoting the line to North Americans. Since then I’ve come to know Kath and many of his staff personally, and have enjoyed the honour of attending every ‘A Family Affair’ since its inception. Professional courtesies, marketing drivel, and fluff aside, I say with the utmost of sincerity that I have always been made to feel like family – extended perhaps, but family nonetheless – each and every time I have visited with the firm in Bochum, or New York, or back in the day during Domotex, or now in Toronto. Watching the staff of Jan Kath Toronto interact with guests, seeing Finlay’s own son deftly piloting the ‘Flying Carpet’, and enjoying the camaraderie of the evening now only re-inforces my belief that success on this scale requires more than simply making beautiful carpets. It requires a family, of biological relation or otherwise, of dedicated, intelligent, creative people who understand – intrinsically – it’s not just about making beauty nor is it just about making money. It is the fusion of the two, three if we are to include a sense of family as a required characteristic, and we are. 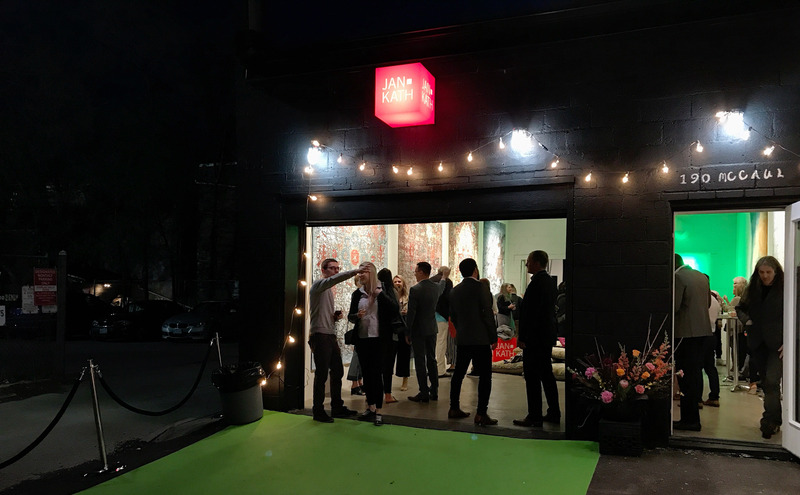 The crowd mingled into the night of Thursday, 10 May 2018 as Jan Kath opened it’s latest showroom, it’s tenth (Is it? ), in Toronto, Ontario, Canada. | Image by The Ruggist. Tired as I was from my early flight into Toronto I enjoyed the party until I was one of the few guests remaining. For me the carpets on display were nothing new; I had seem them all in my esoteric rug world travels as of late. But for guests in Toronto, the beacon of colour and texture which shone brightly punctuating the night revealed a world where everything was new, heretofore unseen, and familiar yet still intriguing and fresh. Situated in a former disused auto repair shoppe, Jan Kath Toronto has not the bland homogeny one might critically associate with Toronto, that is to say, ‘clean New York,’ rather its tucked away location in the heart of a major metropolis gives it an inviting, if not also slightly rough around the edges unintimidating charm. It exudes classic Manhattan SoHo Gallery of the likes before corporate America moved in, and it’s sized rightly as to be functional as well as comfortable. Finlay and Kath graciously provided accommodations during my visit to Jan Kath Toronto. All other expenses, including but not limited to airfare and meals (and coffee) were covered by The Ruggist.